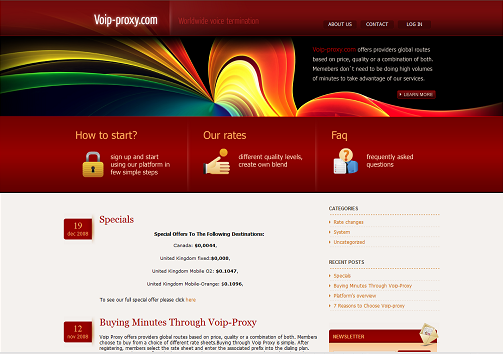 Voip-proxy is an example of voice wholesale termination provider’s platform. Clients can send VoIP traffic with appropriate prefixes determining which level of quality will be used. Each quality level is associated with different rate list. Thus, the client can create own blend, optimizing the quality/price structure. placing particular web components on desired pages. The Web components are made in Flash and can be added to any html page (or generated dynamically for example in php, aspx or others). They are seen by web browser as a common flash object. Therefore there is almost no limits for webdesigner in creating the layout. When the components are initiated aftfer opening a page they connect to VSService and exchange data with the server directly, without reloading the page. More about configuring and types of the components is described in Online Documentation. tariffs – component showing rate tables, with search functionality (both by prefixes and descriptions), export to CSV, multiple rate lists selector. The main interface of WTP is linked directly to “log in” test in the header which causes the login screen of WTP appear. Another method is to put the login form directly in the html code and then pass the parameters to WTP url. Previous PostGoing to Miami, visit us at ITEXPO 2009Next Post2008 is leaving! Purchase Voipswitch with our end of the year pricing!